A brilliant explosion blossomed out before me, so intense that all around turned black in contrast to its glaring colours. The nucleus seemed suspended, burning on our course, while subsidiary explosions spewed smoke-tailed fireballs out like Rockets, and showers of Green, White, Red and Golden light fell slowly from its midst. Stiff with fright, and so blinded that I couldn’t read the Instruments, I tried to reconcile the phenomenon with normality. I told myself: ‘This is a Scarecrow Flare, the type we’ve been told about. It doesn’t frighten me.’ But still, it fascinated me…flinching in my seat, I flew through the Burning Embers of that awful airborne pyre ‘. ‘Scarecrow’? 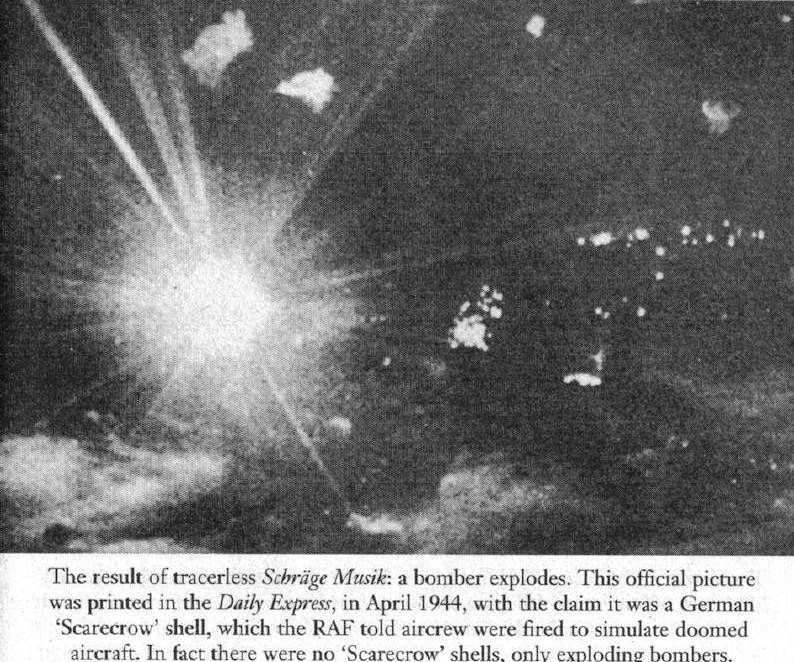 “Scarecrow” shells was a myth propagated by Bomber Command to attempt to reassure Night Bomber Crews who were absolutely shattered by the vast number of Aircraft Losses they witnessed on each mission. The losses really were that high and that frequent but this was one method used to avoid admitting the reality as to the losses of other Squadrons on the same Mission. The July 24th/25th 1944 raid against Stuttgart and Donges during which 26 Aircraft were lost, and where this explanation was prevalent. This of 461 Lancaster’s and 153 Halifax’s sent to Stuttgart alone. It was for them, a shocking and unforgettable moment in time during that War. The night raid was intensely dark, and long, being routed far south into France in clear skies before turning into Germany and the “Scarecrows” were clearly visible from long distances away. That indeed some of the most spectacular “Scarecrows” were Pathfinders that were hit by Flak into the Bomb Loads, which were loaded with different coloured Target Illuminators and Flares. The assumption seems to be that Scarecrows were the result of Schräge Musik Attack. The strength of the Schräge Musik attack seems to be to get a greater proportion of the Cannon Shells to hit the Target at a predicted point thanks to close-range and zero-deflection. Clearly also the Fighter was almost never seen but then attacking Night-fighters were seldom seen in the more traditional forms of attack and the end result was often the same, Cannon-fire setting the Wing fuel-tanks alight. The name “Flaming Union” was also used for a number of unrelated Military topics. One of these was the mythical German device that exploded in such a way that it resembled a Bomber being hit, although these also went by a variety of other names, including “Scarecrows”. A number of letters then came in from ex-Armourers who believe that the fault may have lain in their area. There were many different types of bomb and fuse; one in particular, the No.37 Long Delay fuse, had a very fragile internal glass capsule. If not handled very carefully indeed, the glass could crack, acid would seep into the fuse, and….